(WBIR) A bedroom can be a place of rest, a safe haven and even where a child's imagination can come to life. A group of volunteers on Saturday took their tools and talents to Maryville to create a special place to sleep and play for a brave little boy. "We call him the incredible Alex, it's his nickname," said Johnathon Johnson. He's talking about his 4-year-old nephew, Alex Wilson. After hearing of Alex's fight against a rare childhood cancer, the non-profit group Special Spaces stepped in to work some magic. 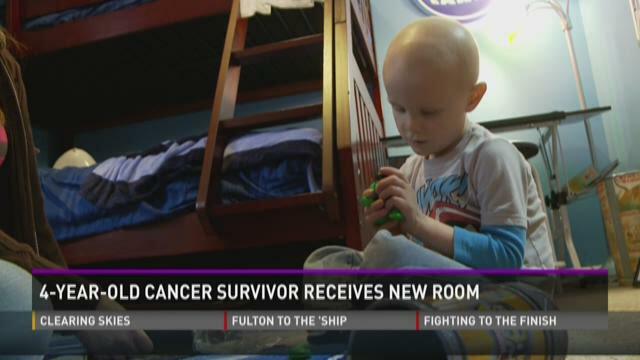 The group transforms the bedrooms of kids battling difficult illnesses. "They sometimes have to stay in that room for a long time, can't go to school so we want to make it enjoyable and comfortable for them so they can heal and relax," said Chris Lamberson, the Tennessee Director of Special Spaces. The volunteer crew hammered away for hours, while Alex and his family were out of the house. Uncle Johnathon Johnson jumped at the opportunity to make life a little brighter for his nephew. "About a year ago he came up with this disease, I've been there from day one," said Johnson, "Just to be helping out today, it hits a deep place in the heart." From building a bed frame, to final touches of décor, Johnson played a part in it all along with several others. "It's going to mean lot to Alex when he gets here," said Johnson, "His smile is going to be unreal." The super kid, got a big surprise, and couldn't wipe the grin off his face. Alex and his family came home to an entirely transformed bedroom and playroom. Alex's favorite part? A life-size poster of Alex's larger than life hero, the Incredible Hulk. "His favorite thing is superheroes and he wants to be one, so through what he went through it makes him one." said Johnson. This was the organization's 501st bedroom makeover project. Right now, they have a long list of kids rooms they are hoping to transform. If you'd like to help, you can find more information here.